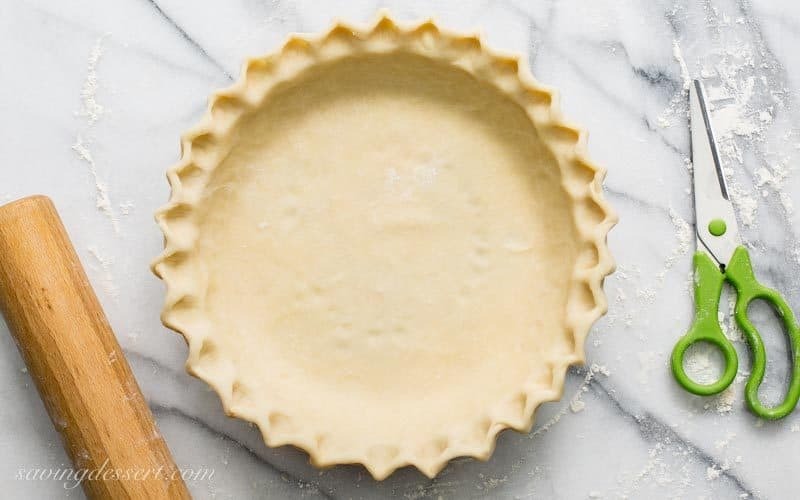 Perfect Pie Crust Recipe in 3-easy steps – with just a little patience and practice, you can make flaky, delicious pastry for all your favorite pie recipes. Thrill your pie loving friends and family and let this be the year you make homemade, completely from scratch, pie crust! But before we get ahead of ourselves let’s start by saying I’m not a pastry chef, nor do I claim to have the only pie crust recipe in the world that works. However, I’ve been making pies since I was 10 years old (a long time ago), and I once won a blue ribbon at a county fair for my apple pie. Not the same as a culinary degree, I know, but I’ve done the homework. Pies have always been the most requested desserts I make. There are more than 70 pie recipes posted HERE on Saving Room for Dessert so I think it’s safe to say, I have some pie street-cred! 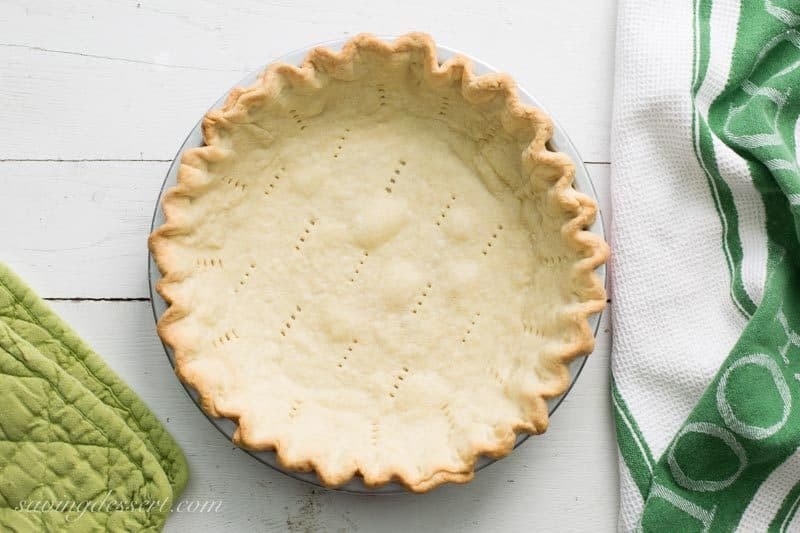 You don’t have to use a food processor to make pie dough, but it sure makes it easy! 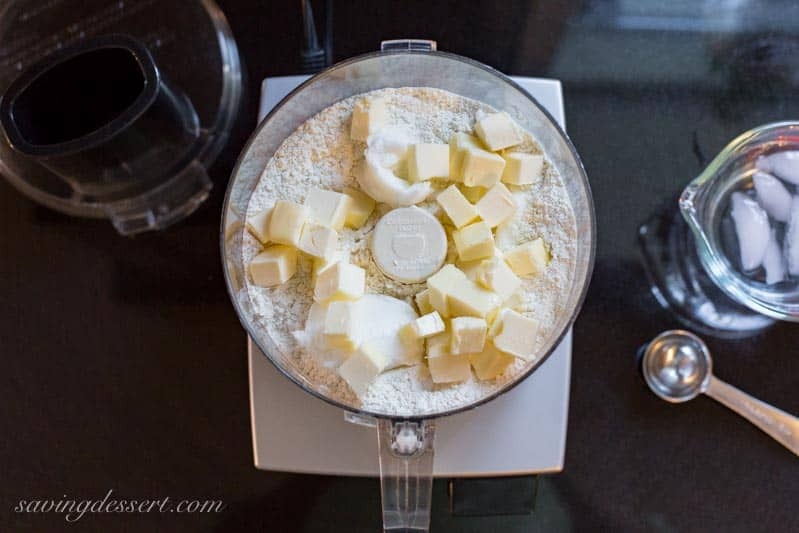 I’ve shared a link for an inexpensive pastry blender at the end of this post. 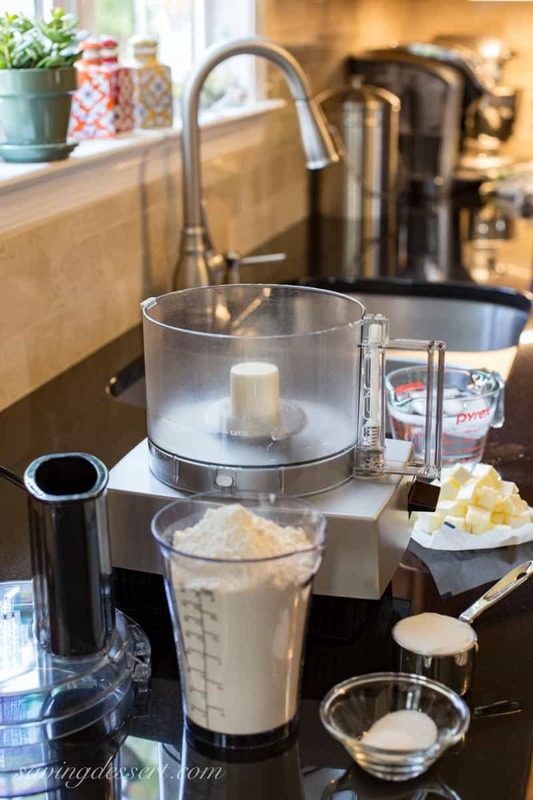 It’s a great tool for making our Perfect Pie Crust Recipe without a food processor. This recipe makes enough for two pie crusts. I recommend making the recipe as is and freezing the second disc of dough if not needed immediately. Frozen pie pastry will keep for 3 months if sealed in plastic wrap and stored properly in a freezer bag. Thaw the dough overnight in the refrigerator before rolling out, filling and baking. 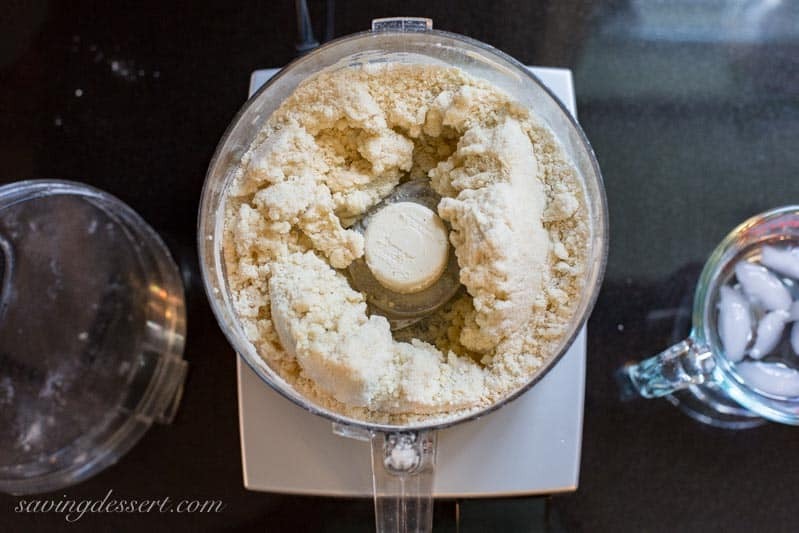 Combine the flour, granulated sugar, salt, cold cubed butter, and Crisco shortening in the bowl of your food processor. Process (using short bursts/pulses) until the mixture resembles a coarse meal. There should be some small pea sized pieces of butter visible. Do not over process. Add three tablespoons of ice cold water and pulse a few times to combine. It should start to come together with plenty of dry flour still visible. Add the remaining 3 or 4 tablespoons of cold water and process just until it starts to clump together. 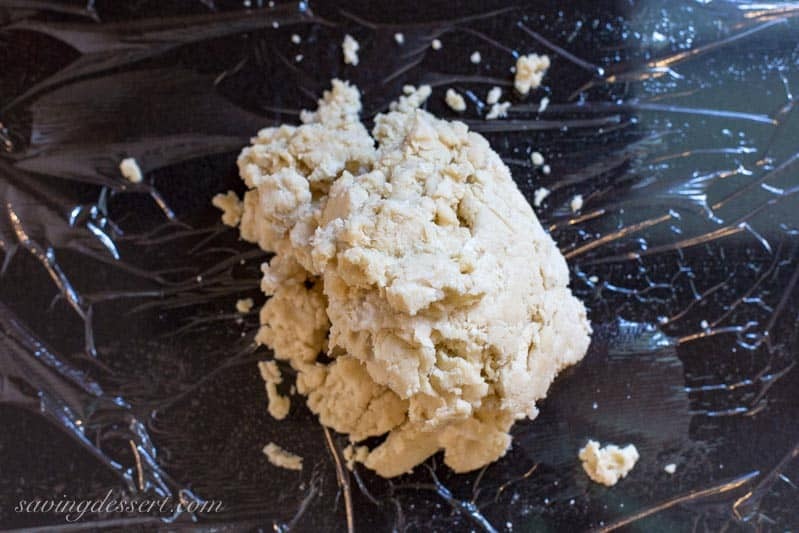 Dump the crumbly dough out onto a piece of plastic wrap. Gather the dough together, form into two discs, then wrap each one individually. Refrigerate the dough for at least an hour, or up to three days. Overnight works best! When rolling out the dough, be sure to work from the center and push it out rotating the dough as you go. I’m a visual learner and if you are too, check out our how-to video for a look at the entire process! Also, check the tips at the bottom for lots of great information about making Perfect Pie Crust. CHECK OUT OUR HOW-TO VIDEO! Once the crust is rolled out, trimmed and crimped, you can load it up with your favorite fillings and bake! 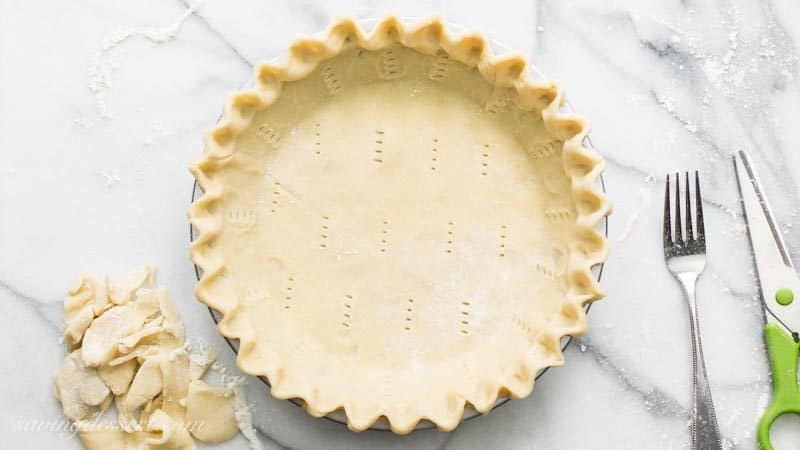 Or if you’re making a no-bake pie filling (like chocolate cream pie) you can pre-bake the crust by pricking the entire pastry with a fork, line it with a piece of parchment paper, fill it with pie weights (see link below), or dried beans and bake until set. Remove the beans and parchment paper and cook for a few more minutes or until browned. Cool and fill as needed. Pricking the bottom and sides of the pastry helps prevent large bubbles from forming. Adding the pie weights or beans prevents the dough from sliding down the sides of the pan. Fill as desired. 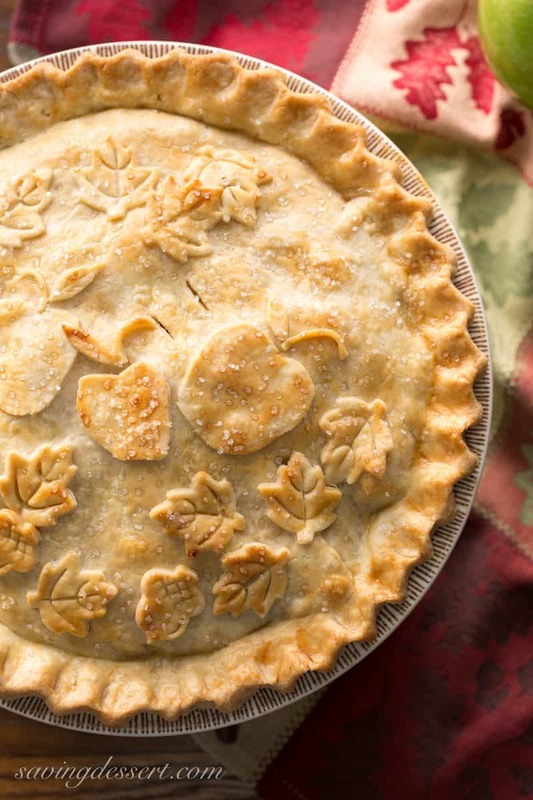 This recipe makes enough dough for our Classic Double Crust Apple Pie. 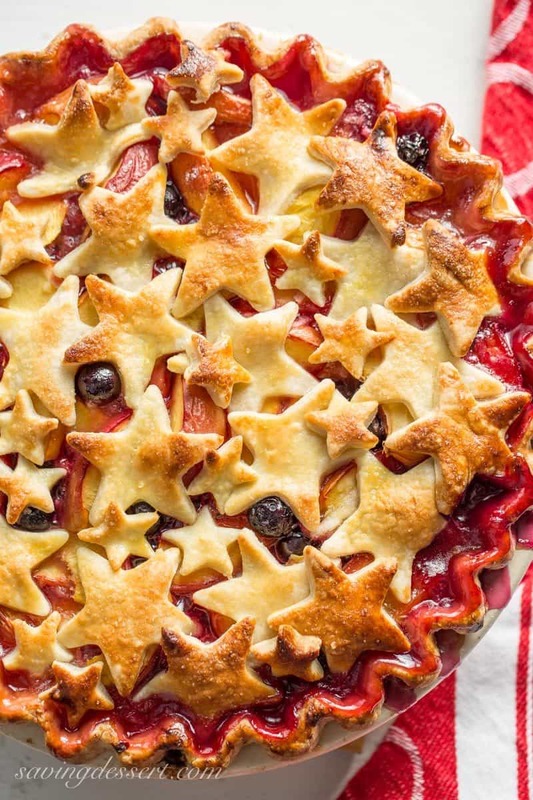 You should have enough scraps leftover to cut out decorative dough cookies to adorn your pie. When making a double crust, be sure to brush the entire top of the pie with an egg wash. I also like to sprinkle the unbaked pie with a little coarse sugar. The egg wash helps the pie turn a beautiful golden brown and gives it a shiny finish when baked. Another easy method for decorating pies is to use cookie cutters to create a themed design. Stars are great for patriotic holidays, leaves and pumpkin cut outs for fall, and snowflakes for winter. 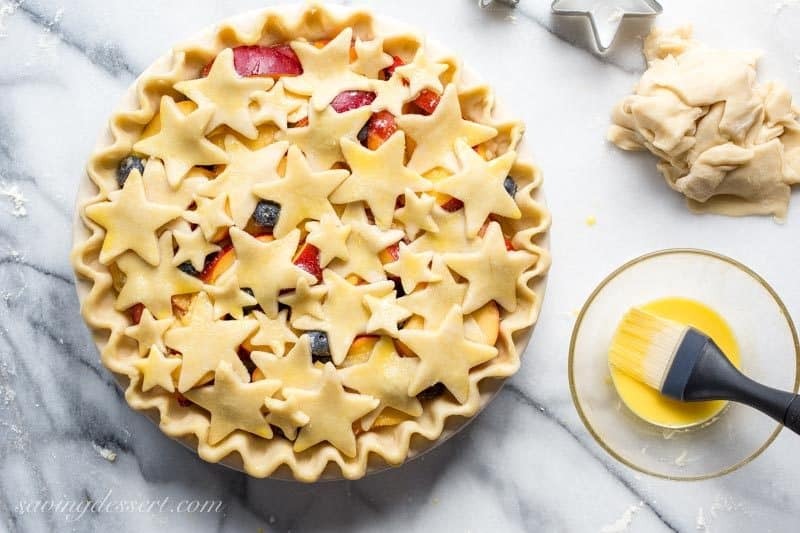 I especially love this method when decorating fruit pies. The juices bubble up in between the cutouts adding color and appeal. Check out this easy recipe for Nectarine Blueberry Pie complete with a how-to video. 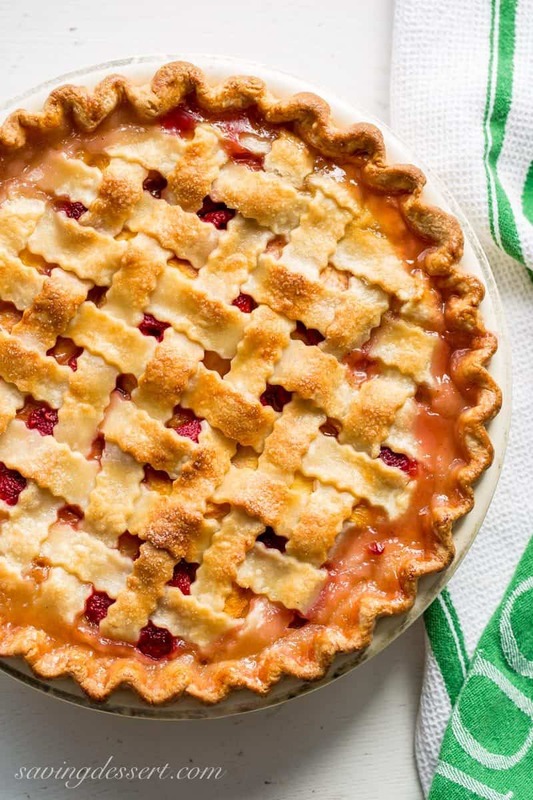 Our Peach Raspberry Pie features a beautiful lattice crust. We shared a how-to video to see how easy it is to weave the design. Make the strips of dough as thick or thin as you want for the desired appearance. Pies don’t have to be perfect to turn out great. Each one is unique and different but always delicious! When measuring the flour, spoon it gently into a measuring cup and level off the top using the back of a table knife. If you scoop out the flour using the measuring cup, it will be packed and you’ll end up with too much flour, making the dough crumbly. It’s important that your butter is very cold and cut into cubes. If the butter is not cold, the dough will stick to your work surface. Cut your butter into 1/2-inch pieces and refrigerate until needed. I’ve found, through lots of trial and error, that a pastry crust made using half butter and half solid shortening performs the best. The crust will turn a beautiful golden brown but not be greasy like many all-butter crusts can be. I don’t refrigerate my Crisco shortening but it wouldn’t hurt if you want to try. I always use Land-O-Lakes unsalted butter. I’ve ruined more than one crust using generic or grocery store brands of butter that may be greasier or have more moisture than good quality butters. I also prefer to add my own salt instead of buying salted butter. Personally, I can tell a difference in the flavor. Use ice cold water. Fill a measuring cup with ice, then cold water. Set aside until needed. 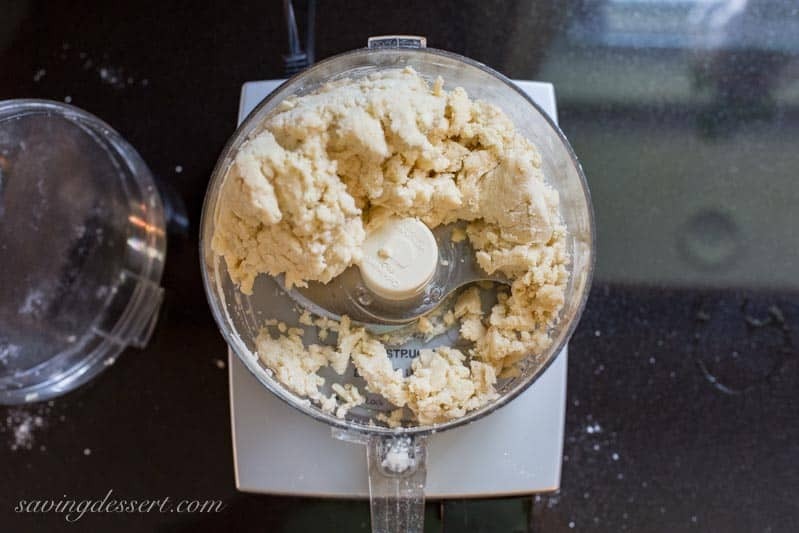 Do not over process the dough if using a food processor. There should be small chunks or pea sized pieces of butter visible. The chunks of butter melt when baked creating the flaky layers we all love in a good crust. If too much water is added to the dough, it will become tough and no longer flaky. I like to add the least about of water needed to form the dough. I start by adding 6 tablespoons, then add the 7th if needed. Humidity can also affect the dough so use less to start and add more if needed. The dough should never be pasty or wet. Refrigerate the dough at least an hour, but preferably overnight, before rolling it out. Generously flour your work surface before rolling out the dough. Use a good wooden rolling pin, and never wash it with soap. Clean with hot water and dry before storing. It’s nearly impossible to roll out dough on a hot counter top. Marble surfaces are popular for rolling dough because they are cool. You don’t need marble but make sure the surface is cool and the room temperature is not too warm. If the dough has been refrigerated for more than a few hours, you may need to let it rest for 10-15 minutes before it’s soft enough to roll out. Run your hand over the dough as you roll it out to check for thick or thin spots. The dough should have an even thickness all the way around. Never stretch or pull the dough. Ease it into the pie plate and scoot it around if needed to fit properly. Stretching the dough could cause thin spots that will not cook evenly and may leak filling into the pie plate. If you have leftover scraps of dough, roll them out again and cut into various shapes using cookie cutters. Brush the “dough cookies” with an egg wash and sprinkle with cinnamon and sugar. Bake for 10-15 minutes until browned. Crust cookies are great as decorations on cream pies, or served as cookies. Waste not – want not! If using dried beans as pie weights, you can cool them down after baking the crust, then store in a container until you make another pie! Flaky and buttery, this is a simple and delicious pastry for all your pie recipes. This recipe makes enough dough for a double crust or two single/bottom crusts. 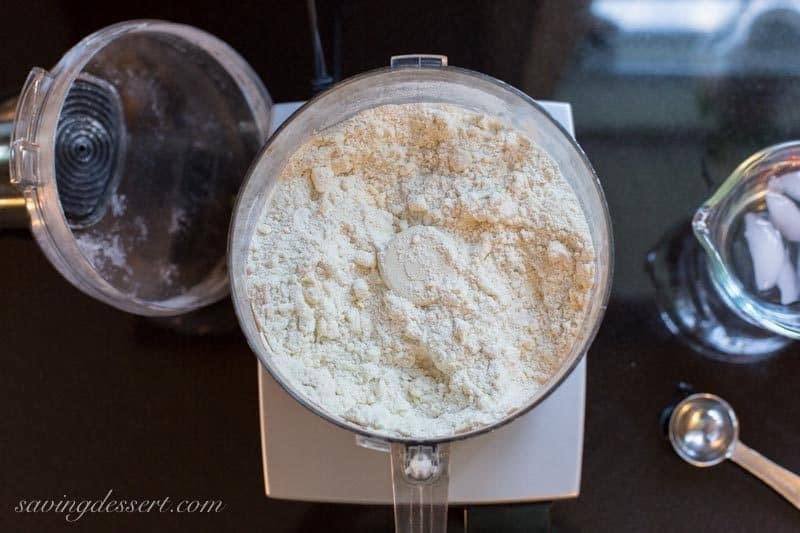 Combine the flour, sugar and salt in the bowl of a food processor. Pulse to combine. Add the butter and shortening and process (using short bursts/pulses) until the mixture resembles a coarse meal. There should be some small pea sized pieces of butter visible. Add 3 tablespoons of the cold water and pulse a few times to combine. Add 3 more tablespoons water and process until the dough starts to hold together. Don't over process. Add one more tablespoon of water, if needed, for a total of 7 at the most. Gather the dough together and divide in half. Form each half into a flat disc. Wrap each disc with plastic wrap and refrigerate at least 1 hour or up to 3 days. You may need to let it come to room temperature for 15 minutes for easier rolling if it's too cold. Place a disc of dough on a well floured, clean work surface. Using a rolling pin, start in the middle of dough and push outward with even pressure. Start again in the middle and press outward but move around like you're hitting all the numbers on the face of a clock. Start at 12 o'clock, move to 2 o'clock, etc. until the dough is in a circle large enough to allow for a 1-inch overhang. 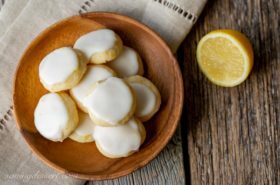 Trim excess dough with kitchen shears. Fill and top with the remaining pastry in your favorite design, i.e. lattice, cut-outs, solid top, etc. Brush the top crust with an egg wash made by beating one large egg with 1 tablespoon of water. Brush over the crust and sprinkle with sugar before baking. Pierce the sides and bottom of the pastry with a fork. Refrigerate the crust for 30 minutes. While the pastry is chilling, preheat the oven to 375 degrees. Remove the pie crust from the refrigerator and place on a baking sheet. Carefully line the pastry with parchment paper, then fill with pie weights or dried beans. Bake the crust for 20 minutes. Remove the parchment paper and pie weights or beans and set aside. Return the crust to the oven and bake another 10 minutes or until it starts to brown lightly. Remove from the oven and set aside to cool while preparing the filling. If only using 1/2 this recipe, wrap the extra pie dough in plastic wrap and seal in a freezer bag. Frozen dough will keep for up to three months. The small print: If you decide to purchase something at Amazon after following my affiliate link, I receive a small commission, at no additional cost to you, which I use to pay for web hosting and services for this blog. Do you have a favorite pie? Our family loves different kinds of pies at different times of the year. 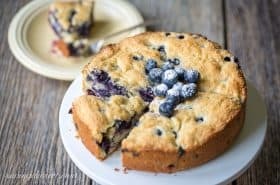 Our Blueberry Crumble Pie is a favorite anytime, and our rich Chocolate Pecan Pie is the family choice at the holidays. Food and Wine has a lovely post listing the Top 10 All-Time Favorite Pies. I think I want to make them all! Saveur knocks it out of the park with this creative post listing 19 Savory Pie Recipes. 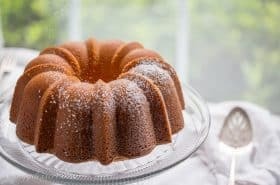 I bet you will find a few to bake! Looking forward to trying your crust recipe. Hope it turns out great for you Dianne. Good luck and happy Thanksgiving! Nice tutorial, but too salty. I would suggest half or maybe a quarter teaspoon of salt, personally. Great tutorial, Tricia! You remind me a lot of my mother, in that you both love/d to make pies and perfectly at that! I like that you combine Crisco and butter and want to give your recipe a try. Thanks for sharing, you are the Master Baker, for sure! Thank you Pam! You are sweet 🙂 We all made homemade pies back in the days before good store-bought crusts. I still like to make my own, each one is different and fun to put together. Thanks again! You are just too sweet Robyn! I wish we didn’t live a thousand miles away so I could bake something for you and bring it over. One day! I thought I would never be able to make such a perfect pie crust! Thanks to your recipe, it turned out awesome. Thanks again, Tricia! That is wonderful news Agness! Thank yo uno much for letting me know. Now you’re ready for the holidays! Everything you do is so perfect! I have done pie crust in the food processor but not as many as you. Must try a combo of crisco and butter. And your pie recipes are great! Just sayin’! Really good tutorial! Pie crust scares most people, but with your instruction and tips anyone should be able to make one. 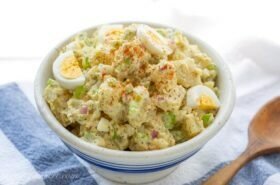 The food processor sure makes it easier, doesn’t it? Good read — thanks. Thank you so much John! And welcome back – hope you had an amazing vacation. I always make a homemade pie crust, but I don’t have a tried and true, go-to recipe. 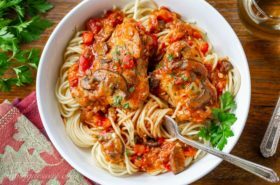 I will be trying yours this Thanksgiving as it looks perfect!!! Pinning!! Looks just like the great crust my mom made. That’s a sweet comment Larry – thank you! Hope the trip is going well. Thank you Jennifer! Hope you had a lovely Canadian Thanksgiving 🙂 And thank you for the inspiration to do this post! Love this very pro and charming video..thank you! I’m so glad you saved your pie! Your pies are always gorgeous and I often wish mine looks so pretty – you are an artist Monique! Aww thanks Sue! I hope you give it a try – so easy! How pretty! I still remember your 50-pie-project..really impressive, Tricia. Thanks Angie – I love to bake pies and remember learning from my grandmother like it was yesterday. Have a terrific week! You make the most beautiful pie crusts Tricia and I’m thrilled to now have all your secrets! Thanks so much for putting this together. Pinning and sharing! I have never been much of a pie baker ! 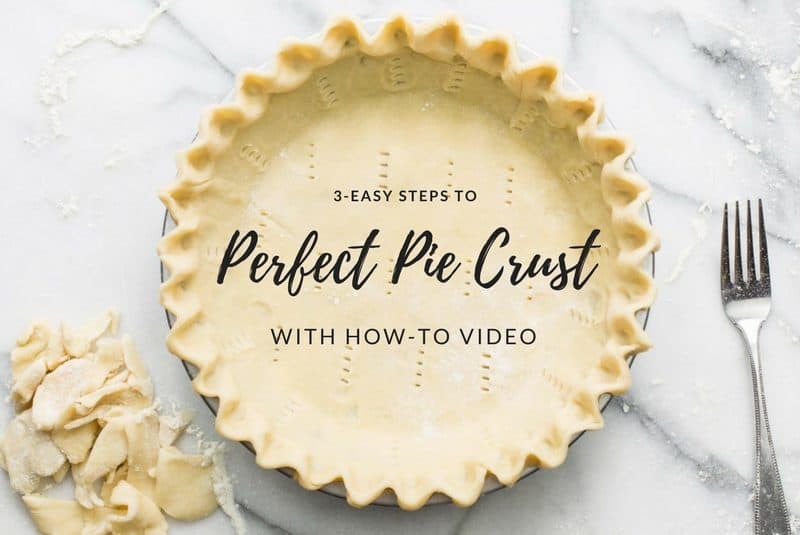 Thank you for this wonderful tutorial on how to make the crust. Pinned, I think my German followers will appreciate it.